Promotions for her film saw Kriti this week in an all-white Forever 21 look, then in a denim on denim one in Forever 21 and Fancy Pants and then today in separates from Koovs. Her promotions looks have been quite refreshing and of the three, loved the white and denim on denim look instantly. Keeping things easy and casual in a tulip-hemmed Fancy Pants dress, Pooja attended a recent event at an NGO. Pop of pink lip color and a pair of ankle-strap flats rounded out the actor’s look. Black separates featuring statement tees was the outfit of choice for both Sonakshi and Alia while travelling out of Mumbai recently. Prefer Sonakshi’s dressed up rocker style or Alia’s comfy one? P.S. Sonakshi is wearing a Lovegen tee and Alia, one from Fancy Pants. 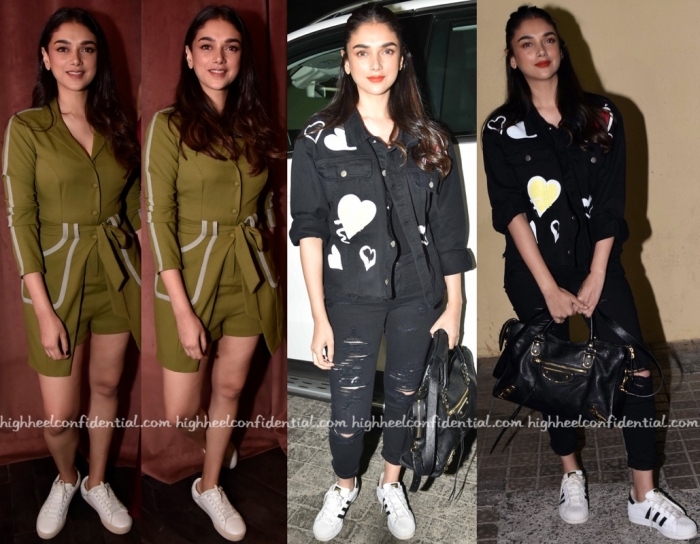 Ms. Sanon opted for white sneakers for a screening as well while travelling out of Mumbai. Between the checked Fancy Pants dress and the Zara Eggceptional tee and denim combo, got a favorite?